Dozing in the summer sun by the water, taking part in an exciting beach volleyball match, getting a tan together whilst the kids build a sandcastle … In summertime in Paris, this is all possible with the Paris Plages event! 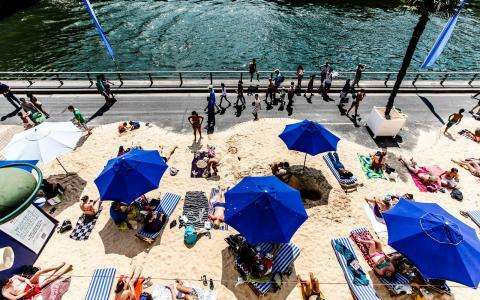 From from mid-July to mid-August, the Georges-Pompidou expressway (4th) and the La Villette canal basin (19th) will be transformed into an oasis of deckchairs and fine sand, inviting Parisians to unwind and take advantage of the many different activities on offer. A boat cruise along the Seine is an essential ingredient of any Paris trip. As you sail smoothly past, the fi nest museums and monuments stand beautifully at attention. River cruises lasting approximately one hour are available in French and English, as well as several other languages. Canal cruises lasting nearly three hours are also available. Enjoy your stay in Paris for a sunny holiday.